You might remember I made a Super Stout back in May this year. Well, Chas made one about a month after that. We don’t have a write up on it, but I can tell you that he added lactose and didn’t oxygenate it (like I did). As there was a lot of lactose added he called it Milk Stout. This was a birthday present and by all accounts went down well. 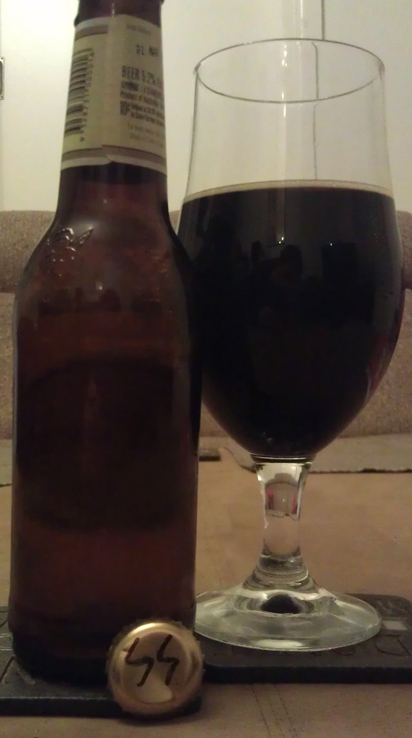 Like the review Chas did of my Super Stout, this comes out nice and black. There’s not much head on this which is quite disappointing. What little there is has a nice brown tinge to it. Looks pretty good. Aroma wise, this is a nice mix. There’s some sweetness, some rich dark malt and some chocolate as well. Not much hop aroma, and that’s a good thing here. First taste is good. Hit of dark malt and is flat. What I mean by that is there’s no distractions from the malt flavour. It’s straight up dark malt. Good round flavour here that fills the mouth from top to bottom. The body on this beer is alright, not great for a stout but also doesn’t leave you thinking it’s not a stout. Overall you’re first met with a big round dark malt burst of flavour. And that’s exactly what you want. In the middle it comes up with some sweetness. This helps with the malt and body. Then the darker flavours come back and help drag out the flavours for a while. As the body drops away there’s the sweet milk flavour from the lactose coming though. And after that a slight bitterness. And the liquorice, which has been there the whole time, comes out and becomes it’s own. Matching this beer with food is a little hard. I would tend to go with something dark and sweet, this is a dessert beer. Rich cake is a good option. Black forest cake or chocholate mud cake get’s my vote. So, this is a good and well rounded beer. The body lets it down, that’s possibly because the beer comes in at only 4.8% alcohol. The flavours towards the end get a bit muddled. But that first mouthful works great. And you keep wanting to go back for more. And this is a great example of two brewers making (nearly) the same recipe with quite a different outcome. Cheers Bishop. Have a keen stout drinker in the house. So there’ll be plenty more brews in the future.